The rains continue in LA, and one of my favorite comfort foods on these gray days is a big bowl of mussels with crusty bread to dip in some buttery, herbed broth. I always order the ale-steamed mussels when I go to The Village Idiot in LA - just try snatching a bite from me and you'll be flat on your back. It's a surprisingly easy and fast dish to make, and perfect for all you single Lush Chefs out there. This no-nonsense recipe came courtesy of the New York Times - I halved it for myself, so if you need it for two, just click on the hyperlink. A Lush Chef word of advice, always use fresh mussels. - Rinse mussels under cold running water and be sure to remove their beards (that hairy stuff around the shell). Scrub the shells well with a veggie brush so they're clean and pretty. - In a heavy medium pot, heat olive oil, then add thyme, garlic, shallots, and a pinch of salt & pepper. - Saute for about 3 minutes until shallots and garlic are softened. - Pour in ale and bring to a simmer. - Add mussels and cover pot with tight-fitting cover. - Let the mussels steam, stirring twice, for about 5 minutes until they open. - Meanwhile, spread a little butter on the sliced bread and put in your broiler until nicely toasted. - Use a slotted spoon to transfer mussels to a medium bowl. Discard any that haven't opened. - Add butter, herbs and mustard to the broth and bring to a boil. Whisk until the butter melts and taste to correct seasonings - if the broth tastes bitter, then add more butter. I had to do this because Stella has a more bitter aftertaste. 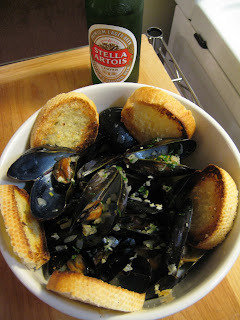 - Pour broth over the mussels and serve with the toasted bread slices. - Preheat the oven to 375. - Combine flour, baking powder, sugar and salt in a mixing bowl. - Add beer and cheese, mixing as little as possible. The batter should actually be on the lumpy side. - Pour the batter into a medium loaf pan and brush the top with melted butter. - Bake in the oven for 35-40 minutes. I've been cooking with all these different beers this month, including ales and stouts, but what's the difference between the two? We all know that ale has a lighter, fruitier flavor, while stouts are dark, heavy and sometimes have a chocolatey or coffee taste. Beer can be broken up into two categories - ale and lager - and they're defined by the types of yeast used and the temperature at which they ferment. Stout is actually a type of ale. Ale is made from malted barley and is fermented at a high temperature so the yeast rises to the top rather quickly, giving it a sweet and fruity flavor. The hops in ale contribute to all those different herbal finishes you can get, and also serves as a bittering agent to counteract the sweetness of the ale. The term "ale" was initially used to describe brews made without hops, but as the popularity of using hops increased amongst brewers, it was then attributed to just a bitter-tasting brew. Stout is made from pale malt, caramel malt and unmalted barley. It has a higher alcohol content and a darker color than ale, and it can be flavored with dark fruit, chocolate or coffee. The word stout originally meant "proud" or "brave," but after the 14th century, it took on the meaning of "strong." 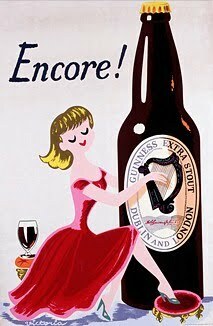 The first known use of the word stout to describe beer came from a 1677-dated Egerton manuscript - there were 67 total, composed by Francis Henry Egerton, that dealt with French and Italian literature. I bet you didn't expect to learn about British history too! Sometimes when I do a lot of cooking, I have a ton of random ingredients/booze left over in the fridge and pantry. What's a girl to do? The Lush Chef makes stew! It's the best way to use up all those veggies, leftover soup stock, an open bottle of wine, or that random bottle of beer. Plus, it's recession friendly! Herbs - Again, use whatever you have. I tossed in a bay leaf and some fresh minced oregano from my little herb garden. Carbs - great opportunity to use leftover pasta, rice, lentils. I didn't have any of those, so I whipped up some dumplings with chives (2 cups flour, 4 tsp baking soda, 1/2 tsp salt, 2 Tbs butter, 3/4 cup milk, minced chives - mix all together, spoon into boiling stew and cover & steam for 12 minutes). Crack open a cold one or finish up that bottle of wine, already! Keeping with the Irish theme this month, this cocktail is a spin on the typical Jameson & Ginger drink. I've always felt that regular ginger ale just doesn't pack enough of a real ginger flavor. Ginger Beer, while non-alcoholic (some brands do have slight traces of alcohol - under 1%), is a lot more potent and uses a lot of real ginger in the flavoring process. This is yet another great cocktail to usher you into spring. Add the whiskey over a glass of ice and top with the ginger beer - Cheers! Here's the second Lush Chef cupcake recipe that I promised, and just in time for St. Patrick's Day tomorrow. I stumbled upon this cake recipe from Nigella Lawson - I'll have to make this again as just a regular cake and use the cream cheese frosting she recommended. I was craving something more chocolatey though and opted for a Guinness chocolate buttercream frosting. To add a bit of whimsy, I also filled the middle with a vanilla bean & cinnamon whipped cream. It's like an adult Hostess Cupcake! - In a large saucepan, combine Guinness and butter. Place over med-low heat until butter melts, them remove from heat. - In a separate bowl, combine sour cream, eggs and vanilla and mix well. Add to Guinness mixture and whisk. - Add flour and baking soda and whisk until smooth. - Fill muffin cups a little more than halfway with batter, and bake for 25+ minutes. Cool completely. - Beat all ingredients together with mixer until stiff peaks form. - Beat butter for a few minutes with mixer on medium speed. - Add the confectioners sugar and cocoa powder, and turn mixer on lowest speed until sugar has been incorporated with the butter. - Increase mixing speed and add 3-4 Tbs Guinness. - You can add more sugar to thicken the consistency or more Guinness to thin it. This week I went sailing with some friends (post-tsunami advisory...) and it was BYOB, so I brought my booze in the form of cupcakes. I made a vanilla base cake with a recipe from one of my favorite cupcake shops in Santa Monica, Vanilla Bake Shop. It's a little complicated, but so worth it. The frosting is a vanilla buttercream with Baileys Irish Cream substituting the milk/heavy cream. I hope this gets all of you Lush Chef fans in the mood to celebrate St. Patrick's Day! I'll be posting the second recipe on Wednesday. - Beat butter and sugar together using a mixer until light and fluffy. Add vanilla and beat to combine. - Add egg yolks, one at a time, beating well after each addition. - Sift together both flours, baking powder, salt into a separate bowl. Add flour mixture to your large bowl and mix until well combined. Add sour cream and mix that until well combined. - In a separate bowl, beat egg whites with mixer until stiff peaks form. Gently fold egg whites into batter. - Fill each muffin cup 1/2 full with batter and bake for 20-25 minutes. Let cupcakes cool completely before frosting. - Add 3 cups of confectioners sugar and turn mixer on lowest speed until sugar has been incorporated with the butter. - Increase mixing speed and add salt, vanilla extract and 3 Tbs Baileys Irish Cream. - You can add more sugar to thicken the consistency or more Irish Cream to thin it. I always like to use pastry piping bags when I frost cupcakes. Also, these cupcakes needed some color, so in the spirit of the Irish, I threw on some green sugar crystals. Your bottle of Irish Cream is good for over 2 years (30 months is the shelf life, according to Baileys), regardless of whether or not you put in the refrigerator. It's that lovely combination of fresh cream, sans preservatives, plus the whiskey/spirits, that acts as a natural preservative. Nothing like a crap load of alcohol to give something a shelf life, right? However, keep note that Baileys will go bad, and sometimes that 30 month timeframe doesn't always apply. It depends on how long that bottle has been sitting around in the store, and room temperature can have an effect as well. Just know, that if you open it up and that whiskey and cream has separated...umm, throw it out. The Lush Chef likes to buy the smaller bottles because she likes everything fresh. Libations left over: Pretty much the whole bottle, so pour yourself a glass & save the rest for another lush dish, or for your guests. In honor of Mardi Gras tomorrow, I was in the mood for some jambalaya and stumbled across this recipe in my files for Red Grits & Shrimp from chef Marcus Samuelsson. It's not quite jambalaya, but it's close! Despite the chili powder, this is not spicy, so the Lush Chef's mother would enjoy this too. - In a medium saucepan, warm 1/4 cup olive oil over med-low heat. Add onion, half the garlic, 1/2 tsp. chile powder, 1/2 tsp. paprika and cook until onions soften (about 5 min). - Add the grits, bay leaf and cook, stirring for 30 seconds. - Add the crushed tomatoes, corn, 1/4 cup white wine and 3 cups water. - Reduce heat to low and simmer the grits, stirring frequently, until liquid is absorbed and grits are creamy (about 25 min - now would be a good time to sip that wine between stirring). - Discard bay leaf and season to taste with salt and pepper. - Between your stirring sessions and wine sipping, combine 2 Tbs of lemon juice with 1 Tbs of that remaining olive oil, the rest of the chile powder & paprika, and shrimp. Let it sit for 15 min at room temp. - In a medium skillet, cook the shrimp and remaining garlic over high heat, stirring, until just pink (about 2 minutes). - Add the remaining 3 Tbs olive oil, remaining 1/4 cup white wine, 2 Tbs lemon juice, the cherry tomatoes, cilantro and parsley, and cook for 2 more min. - Remove from heat and season to taste with salt and pepper. - Serve those grits topped with shrimp, tomatoes and sauce and serve immediately. YUM. In preparation for Mardi Gras on Tuesday, I'm bringing you an old New Orleans' classic cocktail - the Vieux Carré (pronounced VO carRAY). Most people think of the Sazerac when they think of vintage New Orleans libations, but I've never been much of an absinthe/Pernod fan. This cocktail was first mixed in the Carousel Bar of the Hotel Monteleone by Walter Bergeron in the 1930's. The name translates to "old square" after the French quarter where the hotel was located. This is the perfect winter/spring transition drink with all those herbal and spicy notes playing around on your palate. Combine all the liquors over ice in an old-fashioned and stir well until glass is chilled. Garnish with lemon. The primary difference is that the Irish make their whiskey with barley, often a blend of pot-stilled malted and un-malted whiskey. Us Americans make ours with corn, rye or wheat. There are 4 different kinds of American whiskey - Bourbon, Tennessee, Rye and American Blended, but we'll get into those differences on another day. When all those Irish immigrants came over to the States, there was a plethora of corn, so they made do with what they had. Irish whiskey tends to have a barley/malt flavor and is lighter and less sweet than the American full-bodied version. The Irish also age their whiskey in old barrels, and often in ones that used to store another type of liquor like rum or bourbon, thus the subtle differences in flavor amongst whiskeys from the same distillery. Using these older barrels means the whiskey takes longer to mature (minimum of 3 years), whereas us Americans like everything shiny, new and fast. We age our spirits in new, charred oak barrels for a minimum of 2 years, so we don't have to wait as long for the good stuff. Beer, pretzels and chocolate are the ultimate St. Patty's day triumvirate, so when I saw these marshmallows on The Kitchn, I just had to try for myself. Note - I won't always be posting from this site - I just had a ton of back-logged recipes to try! My first attempt at these marshmallows was an epic fail because I didn't have a candy thermometer. My "marshmallow" ended up having the consistency of rubbery taffy. I momentarily thought of using it as a non-stick pad for my laptop....or not. I went out the next day and bought a candy thermometer, which resulted in an epic success. A note on preparation - you'll need to let a bottle of beer sit open overnight so it can go flat, or whisk the beer like crazy to release the carbon dioxide if you don't have time. The marshmallow takes a minimum of 10 hours to cure, so give yourself a couple of days to make this. - Spray a 8.5"x 4.5" bread loaf pan with nonstick spray or rub with shortening. - For the bloom, sprinkle gelatin in a bowl, pour the vanilla and beer over gelatin. - Whisk until no lumps remain. I don't have a stand mixer, but my hand mixer works just fine - it's also better excercise! - For the sugar syrup, combine beer, corn syrup, sugar and salt in a BIG saucepan (at least 4 quarts), because this stuff bubbles and foams like crazy. - Turn the heat to medium-high and bring the sugar mixture to a boil. - With the mixer on low speed, carefully pour the sugar syrup into the bloom. - Turn mixer to high once all the syrup has been added, and whip it for 8-10 minutes. This should get all those bubbles out and give you a lovely meringue-like texture. - Pour marshmallow into loaf pan and let it cure, uncovered, for 10-12 hours oor overnight. - When the marshmallows are cured, rub the top with a little powdered sugar and turn the marshmallows out onto a cutting board. - Rub the other side with more powdered sugar and cut into about 18 squares of equal size. - Melt the chocolate over a double boiler or for 30 seconds at a time in the microwave, stirring frequently until all chocolate has melted. - Coat each marshmallow entirely and set them on wax paper to dry. - While chocolate is still wet, sprinkle tops of marshmallows with crushed pretzels. These tasty treats will keep in a covered container for several weeks, but I doubt they'll last past St. Patrick's Day. I've already had two. 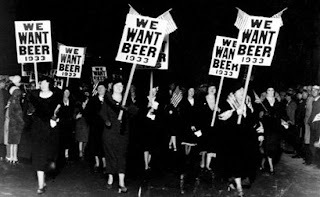 In honor of St. Patrick's Day coming up, I will be dedicating most of this month to that preferred libation of all those who celebrate this day of drinking - BEER. I'll be favoring dark stouts, a la Guinness, and maybe I'll even throw in a recipe with some Bailey's Irish Cream. "There are only two kinds of people in the world, the Irish and those wish they were."